"Fried plantains are cut into chips for another fantastic little appetizer from Puerto Rico. 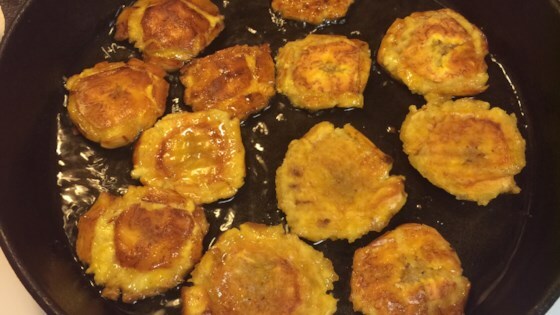 Tostones may be served with ketchup (kid's favorite) or with garlic in olive oil." Heat the oil in a large skillet over medium heat. Add the plantain slices and fry until they soften, 5 to 10 minutes. Remove from the oil and drain on paper towels. Use a tostonera (a press) to slightly mash each piece until it is about 1/2 inch thick. If you do not have a tostonera, use a mallet or place the pieces between a folded paper bag and press down with a saucer. Press all of the pieces before going onto the next step. Return the pieces to the hot skillet and fry until crispy, about 3 minutes per side. Drain on paper towels and season with garlic powder and salt while still warm. Also be sure to add Adobo! It adds a great flavor. Very simple, yet tasty. Tastes much better homemade than the platanos in the bag! My inlaws from Honduras also make tostones...thanks for the reminder to make some soon! SOOOO GOOD. 10x better than french fries!! these were very good, served with a roasted veggie and tomatillo salsa. The husband liked these but I didn't love them.